Davis Dai Kim-ping was born and raised in Hong Kong. At the young age of 11, Davis’s entire life changed before his eyes. In a tragic traffic accident that put him immediately into a coma, he awoke to find that doctors had amputated his right leg. Following this accident, Davis found himself faced with challenge after challenge as he tried to adjust to a life as a disabled person in Hong Kong. Fighting physical and mental battles over the years, Davis found courage through athletics. 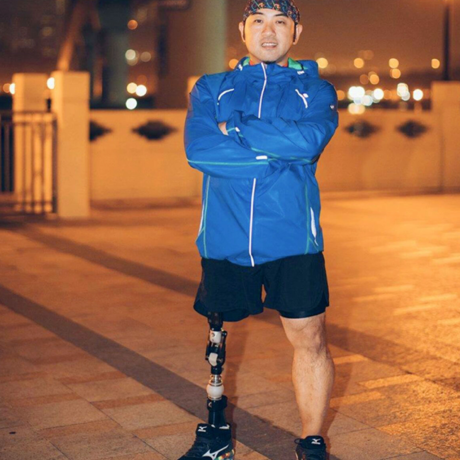 His hard work and training paid off when he swam for Hong Kong in the Asian Paralympic Games in 2002 and won a silver medal at the Asian Rowing Championships in 2007. Now at age 41, Davis is the Creative Supervisor of Social Enterprise of Direction Association for the Handicapped, a non-profit association with the mission of promoting a mutual-help spirit among the physically handicapped community.